Flavored liqueurs are so ubiquitous at this point that it’s no longer really news when a new concoction comes rolling out of the major player distilleries. Malibu is among the most prolific, with over 14 different flavor versions of their famous coconut rum. One of their newest, introduced earlier this year, is the Peaches n’ Cream. It actually quite good, although with its lower alcohol content, it could almost be considered more of a liqueur than a true base spirit. 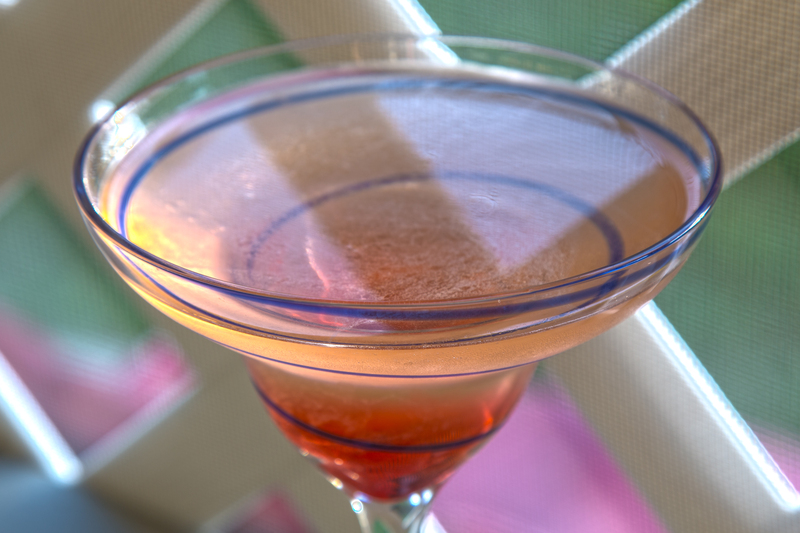 Either way, we infused it with some green tea and added a bit of grenadine and white rum to give a boost. Combine the Malibu and silver rum in a cocktail shaker and add the tea bag. Allow to steep for at least 10 minutes (longer for a stronger flavor). Remove the tea bag, fill the shaker to the top with crushed ice and shake well. Pour the grenadine into the bottom of a frozen margarita glass, then slowly pour the rum over the top to create a layer between the two. The green tea keeps this from being overwhelmingly sweet, but it’s still definitely something to sip by the pool on this hot nights. It is powerful, so it can also give you a quick buzz if you’re not overly careful.